TV! My reliable, trustworthy friend. I have not been good to you this year. I used to pride myself on how quickly I could binge watch a show (in sophomore year of high school I watched all of LOST within two weeks during finals) but now I’m lucky if I can even finish watching a vine. My attention span is rapidly dissolving. But the show that definitely stands out amongst the small handful I watched this year is Netflix’s Bojack Horseman. It’s a weird show, man, but it’s also hilarious, poignant, sad, and smart. It makes you think and feel a lot more than you’d generally expect from an adult animated show about a washed up sitcom actor who’s a literal horse. One of my favorite quotes from the show is what Diane says to Bojack when he asks her if she thinks he’s a good person, deep down. She says, “That’s the thing, I don’t think I believe in ‘deep down.’ I kind of think all you are is just the things that you do.” I’ve thought about that line a lot since I watched that episode. I think I let myself off easy a lot of times. I let myself float through life on a semi-inflated sense of my own goodness. Like, “that’s difficult so I’m not going to do it buuuuut it’s chill because I’m overall a decent person.” Are you though? You have to prove your goodness and keep proving it. I can’t become complacent because of a blurry, non-specific conception I have of myself. I need to ground my view of myself in my actions. Okay, movies. Moonlight was hands down my favorite movie of the year. I saw it twice, gave a presentation on it, and wrote a final paper about it. Nothing I could say about this film would feel adequate, though. Watch it. Watch it a second time. Harry Styles’ spread in Another Man magazine changed me as a person. I’m not shy about my love for Harry but this spread made me want to spend all my money to get these photos plastered on billboards. The aesthetic was weird, eclectic, interesting. I loved the first glimpse we got of the way Harry wants to present himself to the world, and I can’t wait for more. Plus his long hair is immortalized in a photograph of him in a choker, where he looks like Puck in a version of A Midsummer Night’s Dream that I’d want to see. Lastly, I’d like to take a little bit of time to talk about an important relationship I developed over the fall semester. It was completely unexpected and sometimes I still can’t believe it myself. It’s not like I was looking for anything, it just… kind of happened. That’s the beauty of life, isn’t it? Sometimes it just happens and you get caught up in its blustery whirlwind. I’m talking about my newfound adoration for salt and vinegar chips. I am in LOVE!!!!!!!!!!!! I tried them this semester for the first time since hating them as a kid and man! I fell head over heels for that weird tangy flavor. The tangier the better— if it doesn’t feel like the chip is literally engaged in fisticuffs with my tastebuds I’m not interested. After eating a lot of kind of bland food in England (I still love you though @TheCountryOfEngland), my tastebuds are yearning to FEEL something, ya know? Apparently there was a time in the semester that my friend Lily and I were running around campus freaking the hell out because we couldn’t find salt and vinegar chips, but I don’t remember it at all. I guess I was in some chip-induced fugue state? At least I’m passionate about something. 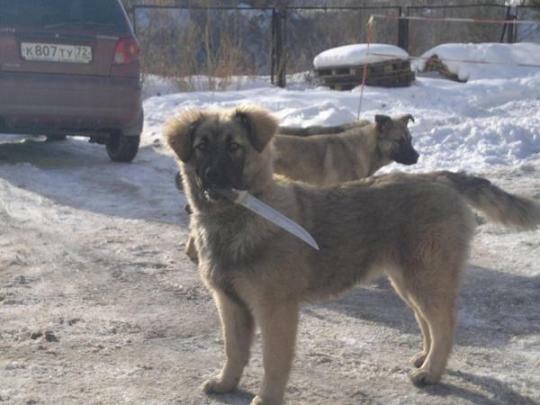 To end off this post, here’s a picture of a dog with a knife. I trust her completely.